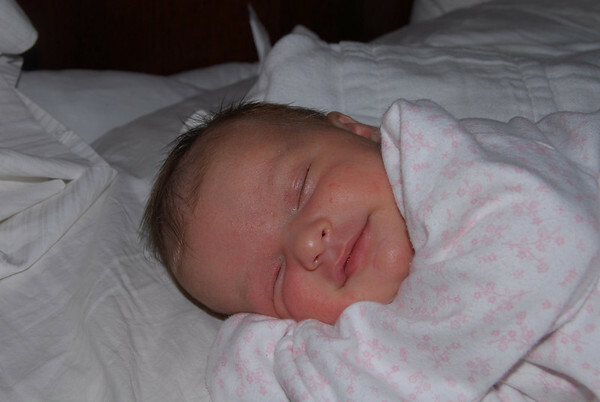 Kenzie turned one month old on May 2nd, 2009. She has been a delight and a wonderful addition to this family. We really thought Abigail was an easy baby, and she was. However, I think Kenzie may be even easier (so far). I remember Abby going through a time where we thought she had a bit of collic, and we had to bounce her on the ball to calm her down. We haven't had that with this one. Kenzie has a lot of dark hair and looks like she'll have dark blue eyes. 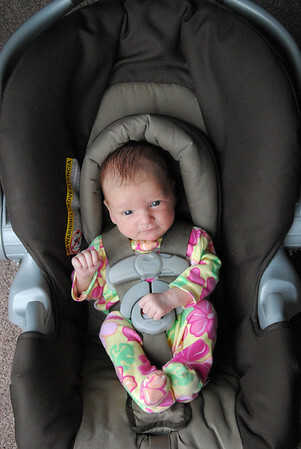 She weighed in at 8 lbs 10 oz (29% bracket) at her first month doctor appointment. She is 22 inches long (80% bracket). That makes her tall and thin like her dad. She has super long fingers, feet and chicken legs. While Abigail resembled me from birth, Kenzie seems to resemble Jeremy. She has been a lot more alert and awake lately. She is a good sleeper (4 hours at a time), eater and cuddler. When she gets upset, her screaming escalates quickly. She's been a little less settled lately, but nothing too challenging at all. At her doctor's appointment, we talked about her belly button, which protrudes a bit. Apparently it's a type of hemorrhage. Basically, the abs aren't close together yet and there's a small hole behind the belly button where the fat surrounding the stomach is pushing through, causing the belly button to poke out. It's not too uncommon and normally goes away by a year. It poses no problem and hers is small. She has been a wonderful addition to our family. She is still sleeping in our bed, and I just love to lay next to her and stare at her beautiful face. Thank you, Lord, for this amazing blessing. Picture to come.